One of the most valuable tools we have when editing and correcting images in Photoshop is the histogram. In fact, histograms are so valuable, they're not limited to just Photoshop. You'll find histograms in lots of other image editing programs as well, like Adobe Lightroom, Photoshop Elements, and Photoshop's own Camera Raw plugin. Many digital cameras today also include a handy histogram feature. In the world of photography and photo editing, histograms are everywhere! So, what exactly is a histogram? Quite simply, a histogram is a graph. Now, I know, as soon as I mention the word "graph", some people will want to take a nap, but I promise you, this is easy stuff. It's also very important stuff if you're serious about your images (and if you're reading this, it's a safe bet that you are). A histogram is a graph that shows us the current tonal range of an image so we can evaluate it and, if necessary, correct it. By tonal range, I mean the range of brightness levels in the image. A histogram shows us how much of the image is currently pure black, how much is currently pure white, and how much of it falls somewhere in between. It's important to note here that even though we're talking about brightness levels, we're not just talking about black and white (grayscale) images. Histograms work equally well, and are equally important, with full color photos. That's because, even though we don't always think of color as being anything more than, well, color, every color in your image has its own brightness level. Yellows, for example, are typically very light; blues are much darker. 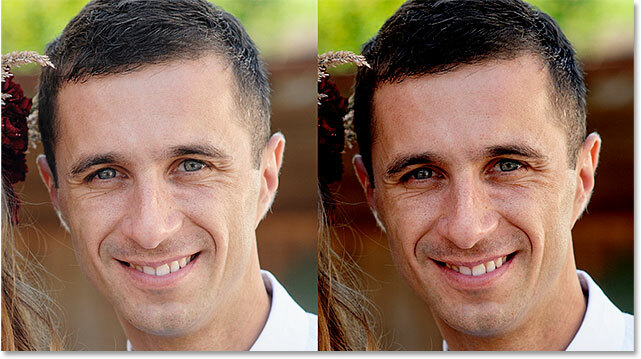 These differences in brightness values mean that color can have a huge impact on the tonal range of your image. How does being able to see the tonal range of an image help us? Well, have you ever looked at a photo and thought it seemed a little "flat"? The subject was interesting, the composition was good, but overall, it just wasn't "popping out" at you? Chances are, it's because the image was suffering from low contrast; the highlights (the lightest areas of the image) were most likely too dark and the shadows (the darkest areas) were not as dark as they should have been. 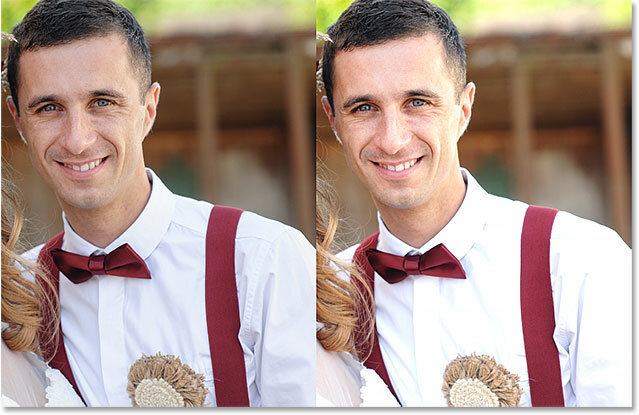 Now, you may have been able to recognize that just by looking at the photo with your own eyes, but when it comes to image editing, the sad truth is, our eyes are not as reliable as you may think. They're great at comparing two images side by side and recognizing which one is better, but when it comes to evaluating a single image, they can be easily fooled into seeing certain areas as either lighter or darker than they really are. Your computer's display (monitor) can also add to the problem if it hasn't been properly calibrated. Setting your screen's brightness too high, for example, can make your images look fantastic on screen but dark and disappointing when you go to print them. A histogram overcomes both of these problems. It doesn't rely on your eyesight or your display settings. Instead, it gets its information directly from the image itself so it's always showing you an accurate, reliable view of the tonal range, making issues such as poor contrast easy to spot and, as we'll see in our Levels and Curves tutorials, easy to fix! Another common problem we run into with image editing is shadow and highlight clipping, where the shadows are so dark, they're become nothing more than areas of pure black, and the highlights are so light, they're just areas of solid white. You may have heard it referred to as "plugging up" or "crushing" the shadows, or "blowing out" the highlights, but it all means the same thing; we've lost image detail. Just as with the issue of poor contrast, it's not always easy for us to recognize these clipping problems just by looking at the photo on the screen. Our eyes are simply not sensitive enough, and our computer's display may not be showing us a truly accurate representation of the image. The histogram, however, will always show us if we've gone too far with our editing and need to back things off to bring back detail. Or, if we're restoring an old photograph, the histogram can tell us if the original image itself is missing detail in the highlights or shadows so we know where we're starting from and what we're dealing with. Bottom line, if you're retouching or restoring images and don't know how to read and understand what the histogram is telling you, then you and your photos are at a serious disadvantage. A black and white portrait photo. The histogram in the center of the Levels dialog box. The black to white gradient bar below the histogram. The histogram's brightness levels match the gradient bar below it. So why does the histogram look like a mountain range? That's because it's showing us the current distribution of brightness levels, or tonal values, in the image. In other words, it shows us how much of the image is at a certain brightness level in comparison to the other brightness levels. That's why some parts of the histogram appear taller than others. The taller the histogram appears at a certain brightness level, the higher the number of pixels we have in our image at that same level. In areas where the histogram is shorter, we have fewer pixels in the image at those brightness levels. And if the histogram doesn't appear at all over certain areas of the gradient, it means we currently have no pixels in our image at those brightness levels. It's important to keep in mind that the histogram is not showing us the actual number of pixels in the image. That's because most digital cameras these days are capable of taking photos that are 10 to 20 megapixels (millions of pixels) or more in size. To fit them all into the histogram, you would need multiple screens to view it! So instead, the histogram simply gives us an overall, birds eye view of how the tonal range of the image is being distributed across the highlights, midtones and shadows, and if any areas are being clipped to pure black or white. The left side of the histogram starts at pure black. The right side of the histogram ends at pure white. The highest points of the histogram are in the highlights and shadows; the lowest is in the midtones. Since the highest part of the histogram is over the lighter tones (the highlights), this tells us that most of the pixels in the image fall within that lighter tone range. We have a lesser but still considerable amount of very dark tones in the image, indicated by the rise in the histogram over the shadows. And finally, the slope over the midtones in the center tells us that while we do have detail in that midtone range, there isn't as much of it as there is in both the highlights and shadows. The photo and the histogram match up. The Levels dialog box showing the histogram for the second image. The histogram starts at black on the left and ends at white on the right, a good sign. The histogram for the second image shows more detail in the midtones than the previous image. Once again, the photo and the histogram match. A tall spike appears at the far right of the histogram. Highlight clipping causes a loss of detail in the lightest areas of the image. A tall spike appearing at the far left of the histogram. Shadow clipping causes a loss of detail in the darkest areas of the image. If you noticed these clipping problems when viewing the histogram on your camera's LCD screen right after taking the photos, you'd most likely adjust your exposure settings and re-shoot them. In Photoshop, you may be able to correct these issues using Levels, Curves or Camera Raw, and we'll learn how to do that in other tutorials. For now, all we're concerned with is learning about the histogram itself. How Many Brightness Levels Are There In A Histogram? The histogram displays one vertical bar for each of 256 brightness levels from black to white. Why 256? There's a couple of reasons for it. First, most of us need roughly 200 brightness levels from black to white in order for our eyes to see what looks like a continuous tone image; that is, an image that flows seamlessly from one tone to the next without any visible gaps or breaks between them. If we drop much below that, we start seeing banding and posterization, where jumps from one tone to the next become obvious. So that explains why the number is at least 200. But why 256? Why not 257, or 300, or 500? That's because of how computers work. We need our images to contain at least 200 brightness levels, but computers need to be able to process and store the images as bits and bytes. Long story short, the best way to meet both of these needs is to store images as 8-bit files (a standard JPEG image is an example of an 8-bit file). An 8-bit image file contains exactly 256 possible brightness levels, which gives us the 200 or so we need for continuous tone, plus a little extra left over for editing purposes. Still wondering where the the number 256 comes from? If you think of 1 bit as being equal to 2, then 8 bits is 28, or 2x2x2x2x2x2x2x2, which equals 256. The numbers below the histogram represent black (0) and white (255), with 254 levels in between. And there we have it! In this tutorial, we learned how to read an image histogram and how to recognize the difference between a well-exposed photo and one that suffers from shadow or highlight clipping. We used Photoshop's Levels dialog box to help us visualize the tonal range that a histogram represents, with black on the left, white on the right and a gradual transition from shadows to midtones to highlights in between. Something to keep in mind is that depending on where you're viewing a histogram, you won't always see a handy black to white gradient below it. That's okay though, because now that you understand how histograms work (and they all work the same way), you don't really need it. So far, we’ve looked at examples of what a histogram typically looks like when an image is properly exposed, with a full range of tonal values from black to white. But that’s not always the case. Sometimes, it makes more sense to limit the tonal range of an image, forcing most of it into the shadows or highlights in order to create a specific mood or style. In the next tutorial, Understanding Histograms - Low-Key And High-Key Images, we'll look at examples of these types of photos (known as low-key and high-key images) and get a better sense of why there's really no such thing as an "ideal" or "perfect" histogram.